Things just keep getting better for Rory McIlroy, who could face Tiger Woods in the third round of next week's WGC-Accenture Match Play in Arizona. Just three weeks after clinching his first tour title, the Ulsterman was named as the Race To Dubai European Tour Golfer Of The Month for January. But he also learned on Monday that he could face Woods in a potentially sensational third round match in Tucson. The exotic sounding title recognises the outstanding performer from the European Tour each month, and the Holywood ace beat off competition from the likes of Paul Casey and Alvaro Quiros, both of whom won during January. “It was a huge thrill to win my first European Tour title against such a high quality field and in the place where The Race to Dubai will be decided in ten months time, " the 19-year-old said after winning in Dubai. McIlroy will return to action in the WGC-Accenture Match Play in Arizona next week and while world No 1 Woods has not played since undergoing knee surgery last June, he is ready to return. Woods is the defending champion in Tucson and has until Friday to decide whether or not he is ready to play in the first World Golf CHampionship of the season. If there are no withdrawals Woods would open against Australian Brendan Jones and Dubai Desert Classic champion McIlroy against South African Louis Oosthuizen, who finished second in both Abu Dhabi and Qatar. If Woods does not play and there are no further withdrawals, Sergio Garcia will face Australia’s Richad Green, Harrington will take on Jones and McIlroy will battle Denmark’s Anders Hansen. McDowell would then avoid Johnson and take on Australia’s Robert Allenby. Tiger Woods could return to action in this week's WGC-Accenture World Match Play in Tucson. But we will have to wait until Friday's deadline to discover exactly which players Ireland's Padraig Harrington, Graeme McDowell and Rory McIlroy will be facing. Barring the late withdrawal of other players through injury, Woods would face world No 64 Brendan Jones of Australia with Harrington taking on American Pat Perez. Rory McIlroy is just two wins away from facing Tiger Woods in the WGC-Accenture Match Play Championship in Arizona. But the young Ulsterman is refusing to get ahead of himself as he prepares to take on the in-form Louis Oosthuizen in Wednesday’s opening round. 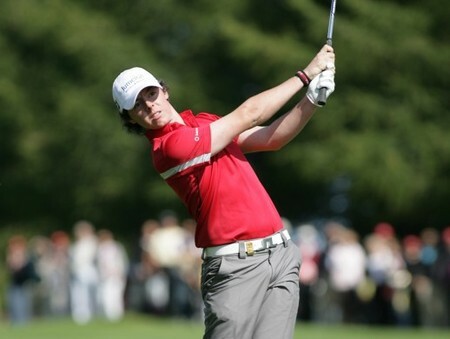 Teenage tornado Rory McIlroy is set to take on Tiger Woods again - less six months before he joins the world No 1 in the pro ranks. The Holywood star, 17, looks certain to make the move on September 10 next year, the day after the Walker Cup at Royal County Down. And he’s determined to keep his game in tip-top shape over the winter with a series of high profile professional tournament appearances on sponsor’s invites, including another meeting with Woods in the Dubai Desert Classic in March.